A major update to Fantastical 2 refines rough edges, extends invitations, adds features like printing, and improves time-zone management. As Apple’s calendar apps for iOS and Mac OS X moved across recent releases from inconsistent, inadequate, and irritating to more or less just fine, the market for replacements grew and matured. 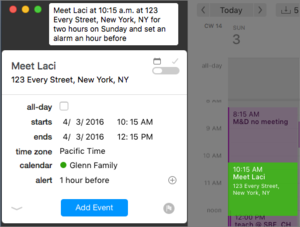 Fantastical for iOS, now in its second release, filled a gap there by not just presenting a clean list and offering strong support for different calendar systems, but also its natural-language processing. Type in a semblance of an event, and Fantastical would parse it and place it for you without fuss. Fantastical’s makers, Flexibits, brought a kind of snippet of Fantastical to OS X in its 1.0: a drop-down day view closely reminiscent of the iOS version. 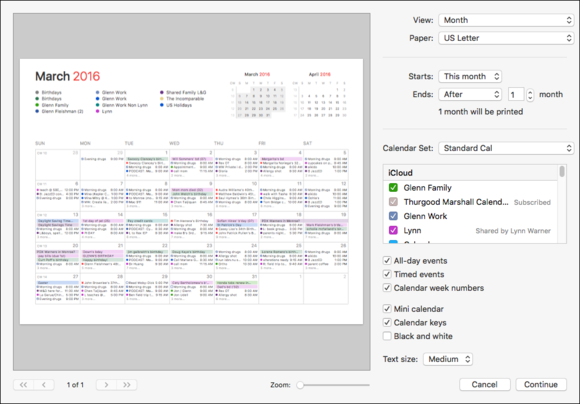 Its 2.0 release in March 2015 was a full-fledged replacement for Apple’s Calendar and a strong competitor to similar products. The 1.0 view turned into the Mini-Window, an optional system menu bar pop-down that gives a capsule view. A 2.1 update later in the year answered many of our concerns in the initial release, but the just-released 2.2 update takes it much, much farther, making it a serious contender in Exchange-based offices. The guiding philosophy for Fantastical 2 is that it’s a calendar app that focuses on upcoming events in a list view, keeping that view active no matter whether you’re looking at a graphical layout of day, week, month, or year. I live in the week view, and the combination of the upcoming list and a glance at the current week tends to work well together. The 2.1 and then 2.2 releases improved and extended ideas sketched out in the initial release, which prompted updated reviews for both versions. 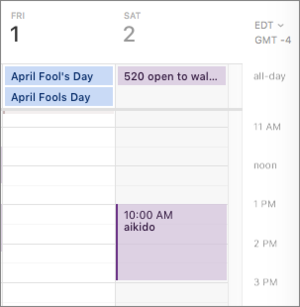 In 2.1, Fantastical interleaved reminders that have a date or date and time set in the graphical calendar view. While this can be disabled, it allows a more seamless flow of untimed reminders, appointments, and to-do items that would seem to better fit how many people approach deadlines and completion. With 2.2, Fantastical is a much more full-fledged part of the process of finding mutually agreeable times for meetings or events with other people, from seeing attendee availability to sending invitations to responding to invites. The user interface continues to deepen, with this release adding multi-event drag-and-drop, enhanced time-zone support for simultaneous display, and (finally) printing! The last was a notable omission that many readers clamored for. Type in something that’s very nearly a descriptive sentence and Fantastical 2 parses out the event information. Fantastical can pick up existing accounts and calendars set in the Accounts system preferences pain, or stored locally or via Exchange, as well as let you manually add other iCloud, Google, Yahoo, and Fruux accounts, or any CalDAV-compatible calendar link. This 2.2 release has full, native Exchange support as well, allowing direct access for invitations, people’s availability status and lookup, and other features. Flexibits has always stressed its natural-language aspect, and it works as well or better in OS X than in iOS. (I’ve used the iOS version for years.) You can typically type a narrative sentence like, “Meet Laci at 10:15 a.m. at 123 Every Street, New York, NY for two hours on Tuesday and set an alarm an hour before,” press return, and you’re done. The date is set by default to the current one selected in the calendar view; the address added to the location field; the end point figured out; and the alarm turned on. This lets you include the kitchen sink when you make an appointment instead of needing to tap buttons and flip levers later, though those options are available to modify as you want. You can also add entries in the drag-and-release model on the calendar layout, but even then Fantastical takes your mouse movements and fills in the parameters related to them and moves the text-entry focus to its fill-in field. Fantastical orients itself around its event list view. The supported vocabulary is quite large, though it’s easy to stump it. For instance, entering, “eat bitter greens every night at 8 pm” works just fine, but “eat bitter greens at 8 p.m. nightly forever” does not. Flexibits says it will be responsive to feedback and expand the vocabulary based on user requests. Starting in version 2.2, the app recognizes partial matches for place names, such as retail establishments, which reduces a step when you want an address attached. Version 2.2 recognizes potential locations and offers auto-complete suggestions. Reminders have more limited parameters, and you can preface your to-do sentence with “reminder” or “remind me to” or the like. If in the process of creating a reminder or event, you can click a switch to flip to the other kind of entry. Version 2.2 also adds the ability to drag and drop the preview shown on the calendar based on your natural-language entry, which is a nice bit of additional flexibility. As with most mature software, Fantastical rewards you by experimenting or becoming a more sophisticated user. While it appears at first glance that you have to choose a calendar from the popup entry rather than type it in, Flexibits hit the shortcut of using a slash followed by the unique part of a calendar name and the appropriate one appears in the calendar field for the entry in progress. If you have calendars named “Soccer”, “Office”, and “Shared Family”, you only need to enter “/So”, “/O”, and “/Sh” to match uniquely. Or you might notice that days and times are entered in a literal format when you drag and drop, and thus enter the current date in full, like 3/25/15, to create an all-day event. An app that grew from an iOS sensibility definitely believes in minimizing the number of “touches” with a mouse as well. This generally works to its advantage. For instance, in the year view—often a somewhat wasted view in other calendar programs that provides too much information and too little functionality—Fantastical uses shading to indicate the intensity of a day from yellow (least) to red (most). Hovering over a day for a moment reveals a floating summary; clicking a day scrolls the list at left to that day’s activities. The year view uses shading to indicate how busy a day is. Clicking an event in the list sidebar or in the Mini-Calendar list or double-clicking an event in the weekly or monthly view brings up an editable pop-over with the same options found when you initially create an event. This also appears when selecting an event in the day view, although in a separate right-hand pane. In its drive to keep its approach clutter-free, options besides the basics are hidden while creating or when editing an event or reminder. Tapping a down arrow or pressing Command-E reveals items, such as invitees, URL, and notes, as well as time zone and repeat in the default area if they haven’t already been set for an event. Given that I often need to enter notes, I wish there were an opt-in preference that allowed the drop-down options to open by default. In version 2.0, navigating to a date on the graphical calendar layout and adding an event would end with a snap back to the current date. If you needed to enter multiple events at that time or edit the details of what you just created, you had to navigate back. Fortunately, version 2.1 added a preference that lets you opt whether or not to stay put after creation. That update also let you cut, copy, and paste events, allowing another method for interacting that fits in naturally. Version 2.2 extends this further: You can select multiple events to move and delete, handy when you’re trying to reshape a week’s worth of things at once. For frequent travelers, Fantastical supports fixed and floating time zones for events: the former used for events occurring at a specific time in a given geographic area (an appointment or a flight) and the latter that should happen at the time of day (such as taking a medication) regardless of where you are. Enter a time zone in natural language or the word “float” or “floating” and Fantastical places it correctly. Time zones are supported in reminders, but not floating times, and the time zone isn’t shown for reminders, though it is set correctly; the problem is with how Apple handles reminders, not Flexibits, however. You can add a second time zone axis on the right, set to any zone in the world you want. The current time zone is derived from the system, but can be overriden in the Advanced preferences. I’ve found time-zone controls maddening in Apple and other apps; Fantastical has the best controls to set and events. It does lack a visual reminder in the list and datebook views that an appointment’s time is non-local, which I feel is overdue for fixing. Even better in version 2.2, for those who are working with people across multiple time zones or travel frequently, is a second axis time-zone scale that you can enable. In Advanced preferences, you can opt to show a second time zone, which appears in day and week views, using any zone you like. This doesn’t affect when events are shown, but let you glance from right to left to see the time in that zone. Very clever. Flexibits uses Calendar Sets to manage which of your calendars appear. I’ve wound up with about 25 personal, family, hobby, and work calendars across seven accounts, and I typically don’t need to see all of them. Rather than constantly display a list of all calendar, active or otherwise, Fantastical offers a Calendars preference to build sets which can be selected among in a pop-up menu at the bottom of the list view. It goes further, too, by using geofencing to choose which set should appear when arriving or leaving at a set location. Version 2.1 added a right-click option to Duplicate a set, making it easier to have a model version that you modify, instead of rebuilding your selections from scratch for each new set. I definitely miss the ability to toggle one calendar on and off, but I also appreciate I use this so infrequently that I prefer having the screen space back for useful information I refer to all the time. 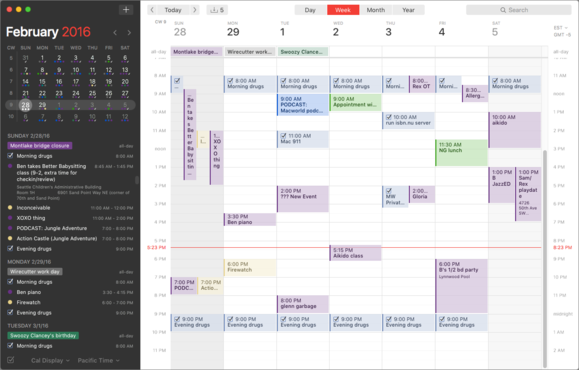 Fantastical worked with Google’s calendaring system in previous release of version 2, but 2.2 is the first that steps up to offer more robust support and for a broader array of systems and software for the whole process of finding attendees, checking their availability, inviting them, and managing responses. These improvements mean more people can take advantage of using the app as a hub for collecting people for an event without having to switch to other calendar software or web apps for some controls or options. A new feature in 2.2 lets you see availability of invitees if the calendar server offers support. More generally, Fantastical offers better interaction with iCloud, Google Apps, regular Google accounts. While adding people to a Google Calendar event, Fantastical can suggest names from your Google contacts. iCloud notifications for shared calendars now appear. Google Hangout links work with Google Apps accounts, where before they worked only with regular Google accounts. And, depending on the remote server’s options, you can see when people are available to make appointments. Peering into availability is a feature long available in intranet software—I was using a package 25 years ago that offered this. It’s nice to see it in a consumer-level product that can provide, in the right circumstances, enterprise-style interaction. The latest version also lets you send event invitations and responses via Apple Mail or Airmail when a CalDAV server doesn’t have the hooks to handle it directly within Fantastical. That’s just another edge shaved down for people who have this server issue. In the small-but-welcome department, holding down the Option key after showing the inbox for notifications and invitations now lets you click an OK All button, dismissing multiple messages in one go. Version 2.2 finally adds printing. That’s “finally” without irony, as many people still like to have a hard copy version of a schedule that they can annotate, give to others, or pin up on a bulletin board. The first pass at printing is comprehensive, as if it had matured alongside other features in the last year. You can choose among the four views (day, week, month, and year) and a list, pick time periods and the number of said time periods to print, and even select your calendar set within the print dialog—that last nuance is rather nice for a new feature. You can also toggle the sorts of events (all-day and timed) and legends (calendar week numbers, tiny inset months) and color. A printing option new to version 2.2 has robust options for customizing and limiting. Fantastical isn’t for everyone, but this 2.2 version continues the app’s maturity by adding Exchange support and making the interface even more robust and sophisticated.